A newspaper, or a news magazine, is, by its very nature, short lived. It holds attention momentarily. For the reader one issue of a paper is like a single frame in a long movie. Only regular readers get the 'movie' effect, the full picture, as it were. For editors and writers, on the other hand, the script is an on-going one. Only rarely is an 'event' a total surprise. Most events give a fair amount of early warning, including revolutions and assassinations. These are 'expected'; only the timing and some details are new. Most editors and reporters who observed the scene in Iran under the Shah 'expected' the people to revolt. Their script provides for repression by the ruler and revolt by the people. They were geared to report the success of either. But the established media's script neither expected nor allowed for the emergence of a powerful Islamic movement in Iran. The media's first reaction was to find a place for the Islamic movement in the existing script of expected events. They found it convenient to represent the early rumblings of the Islamic Revolution as the work of 'Islamic-Marxists'. The media is an integral part of the west's worldview and interprets the world accordingly. The Islamic movement, on the other hand, has a fundamentally different worldview but does not as yet possess an effective media of its own. The Crescent International of Toronto made history when, in August 1980, it came out as the 'news magazine of the Islamic movement'. In its first 12 months this journal has not only lived up to its proclaimed purpose, it has also got better and better. It has raised the standard of Muslim journalism in English to a point never reached before. It has brought a refreshing approach to the task of digging, sifting, reporting and interpreting current affairs. The Crescent International succeeds in giving an entirely new dimension to the modem world. Its style and content are both truly iconoclasmic. A selection of articles from this journal, therefore, is not an exercise in having a 'second bite at the same cherry'. The articles included in this book have been written by a large number of contributors in many parts of the world. Most of them have chosen to remain anonymous. 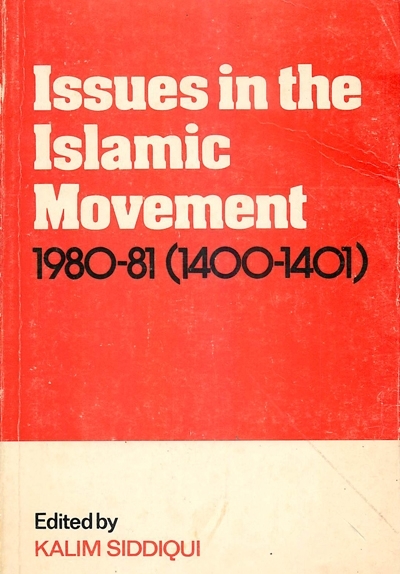 This volume adds significantly to the growing literature on the Islamic movement and its worldview. I am grateful to Zafar Bangash, the editor of Crescent International, for asking me to make the selection and contribute the keynote chapter. My daughter Shama has been chiefly responsible for eliminating most of the errors that inevitably remain in newspaper copy. I am alone responsible for the rest.